Based on type, the household vacuum cleaners market has been segmented into upright vacuum cleaners, canister vacuum cleaners, central vacuum cleaners, robotic vacuum cleaners, drum vacuum cleaners, wet/ dry vacuum cleaners, and others. Canister vacuum cleaners hold the major share, while upright vacuum cleaners have maintained a small yet steady share. However, upright vacuum cleaners are anticipated to grow at a fast pace as these cleaners usually have a wider cleaning path, are cheaper than canister vacuum cleaners, and have easy storage, which is likely to increase the demand for upright vacuum cleaners in small households over the forecast period. Robotic vacuum cleaners are the latest innovation in the vacuum cleaners market, and are anticipated to reach over 3,400 Mn by 2026, in terms of revenue. Sale of robotic vacuum cleaners is witnessing rapid growth on account of their extreme ease of use. In addition, given the high-end technology required for such advanced features, the price of robotic vacuum cleaners is expected to increase during the forecast period. In terms of distribution channel, the market is categorized into online and offline channels. Offline sales are expected to grow at a slower pace as they are affected by the increasing online sales. The online segment is anticipated to expand at a rapid pace due to technological advancements and innovations. Moreover, discounts and options to purchase from several brands have also resulted in the growth of the online purchase option in the household vacuum cleaners market. In addition, busy lifestyles coupled with rise in population of working women have resulted in the usage of online platforms. Thus, this is expected to result in the rise in purchase of household vacuum cleaner appliances through online platforms during the forecast period. Based on geography, the household vacuum cleaners market has been segmented into North America, Europe, Asia Pacific (APAC), Middle East & Africa (MEA), and South America. North America dominated the market in terms of revenue in 2017, followed by Europe. With a rise in population, the market in Asia Pacific is anticipated to expand at a rapid pace. China and Japan are currently leading the household vacuum cleaners market. In addition, changing lifestyles and increasing disposable income in China, India, Japan, and Thailand are providing a considerable push to the demand for vacuum cleaners to replace manual cleaning. The widespread focus of consumers in adopting advanced appliances for convenient and effective cleaning of dirt is a notable factor fortifying the demand. Some of the major players operating in the household vacuum cleaners market are Bissell Inc., Dyson Ltd., Electrolux AB, Eureka Forbes, Haier Group Corporation, HausVac Inc., iRobot Corporation, Koninklijke Philips N.V., LG Electronics Inc., Miele & Cie KG, Panasonic Corporation, Robert Bosch GmbH, Samsung Electronics Co., Ltd., Oreck Corporation, BLACK+DECKER Inc., and Techtronic Industries Co. Ltd. The market overview section of the report demonstrates the market dynamics and trends, such as the drivers, restraints, and opportunities that influence the current nature and future status of this market. An attractiveness analysis has also been provided for every region in the report, in order to give a thorough analysis of the overall competitive scenario of the household vacuum cleaners market globally. Moreover, the report provides an overview of the various strategies of key players present in the market. Based on product type, the household vacuum cleaners market is segmented into upright vacuum cleaners, canister vacuum cleaners, central vacuum cleaners, robotic vacuum cleaners, drum vacuum cleaners, wet/ dry vacuum cleaners, and others (handheld, stick, etc.). Furthermore, the market is bifurcated on the basis of distribution channel into online stores and offline stores. The offline stores segment is further bifurcated into supermarkets/ hypermarkets, specialty stores, and others (independent retailers, small vendors). Geographically, the global household vacuum cleaners market has been analyzed across North America, Europe, Asia Pacific, Middle East & Africa, and South America. The market has been analyzed in (USD Million) in terms of revenue and (Million Units) in terms of volume as well as the CAGR for the forecast period 2018 to 2026. The report also highlights the competitive landscape of the household vacuum cleaners market, thereby positioning all the major players according to their geographic presence and recent key developments. The comprehensive household vacuum cleaners market estimates are the result of our in-depth secondary research, primary interviews, and in-house expert panel reviews. 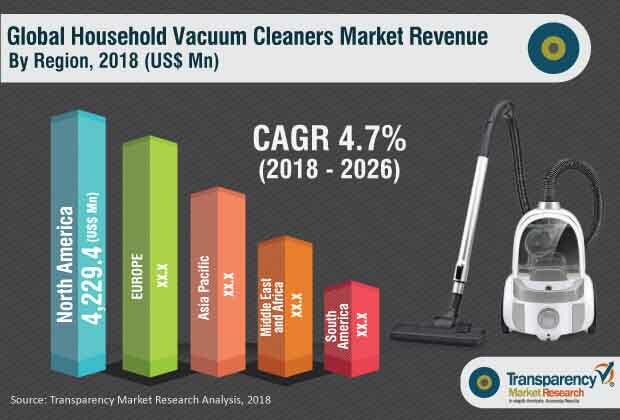 These market estimates have been analyzed by taking into account the impact of different political, social, economic, technological, and legal factors along with the current market dynamics affecting the household vacuum cleaners market growth. In the report, the North American market is divided into the U.S., Canada, and Rest of North America. Similarly, the Europe market is divided into Germany, the U.K., France, Italy, and Rest of Europe. Asia Pacific has been segmented into China, Japan, India, and Rest of Asia Pacific. Middle East & Africa covers the GCC, South Africa, and Rest of Middle East & Africa. Similarly, the market in the South America region includes Brazil, and Rest of South America. Furthermore, Porter’s Five Forces Analysis explains the factors which are currently affecting the household vacuum cleaners market. The report also provides a value chain analysis which explains the participants of the value chain. The global household vacuum cleaners market is characterized by the presence of numerous key players who focus on factors such as price, performance, quality, support services, and innovations to compete in the market. Major players in the household vacuum cleaners market are Bissell Inc., Dyson Ltd., Electrolux AB, Eureka Forbes, Haier Group Corporation, HausVac Inc., iRobot Corporation, Koninklijke Philips N.V., LG Electronics Inc., Miele & Cie KG, Panasonic Corporation, Robert Bosch GmbH, Samsung Electronics Co., Ltd., Oreck Corporation, BLACK+DECKER Inc., and Techtronic Industries Co. Ltd.